Susan Akbarpour is CEO and co-founder of Mavatar, the company behind mCart, a blockchain-powered platform that connects consumers, retailers, and influencers. She’s spent the last 30 years working as an entrepreneur, investor, and product developer, and has built four companies along the way while guiding many more. What does blockchain technology mean for your business? Blockchain may be a buzzword, but it’s helped us solve a huge problem and bottleneck. Last year, we visited the top retailers to tell them we’d created an Uber for retail sales — a platform that makes the world shoppable in a user-friendly way. The only way we could make our platform scalable was to utilize blockchain to tokenize the system. The technology lets us create an immutable smart contract between multiple parties in a transaction. This means we can handle innumerable settlements and micropayments in a fair and transparent way. As a result, we now work with a lot of top retailers, including Walmart. That’s how blockchain worked for us. It helped us bring our solution to market and remove any barriers to adoption. It truly saved us. One big challenge for companies like yours is separating the reality of blockchain technology from the hype. How do we get people to focus on its real value? There’s a lot of doubt and hype around blockchain because only a very small number of platforms are actually making practical use of it. This is exactly like in the 90s when a lot of people were talking about the internet but most didn’t understand how the internet protocol works.” Fast-forward to today, and most of us still don’t know how the internet protocol works, but we’re all using the applications that are built on top of that protocol. The challenge is to make more easy-to-use applications, then adoption will rise. User experience designers have a huge responsibility here. They need to push the complexity of blockchain to the back end and make the front end more user-friendly. Speaking of the applications of blockchain, how will advertisers be able to use it? There are loads of applications for the blockchain, but its best use is removing the bottlenecks and middlemen from a platform or ecosystem. Now that we can see who’s done what for a top retailer, we can cut affiliate networks out of the equation and give brands the ability to reward their influencers fairly and at scale. In advertising, it’s time to be fair and it’s time to be transparent. We’re inundated by so much noise and our lives are cluttered with so much information that we have to process. Now, with the arrival of blockchain, this won’t be as much of an issue. Brands will make a lot of money by cutting the cost of sales and marketing and shifting their marketing dollars to best-performing channels, but only if they’re fair and transparent. Can you explain how blockchain technology will benefit influencers? Today, content publishers have to endure a series of painful affiliate sales processes to monetize their content. I’m talking about things like stiff technology integration and approval processes, expiring cookies, outdated tracking techniques with a high margin of errors — the list goes on and on. With blockchain, we can attribute a sale to the content publishers that did the most important job. This is going to change everything because until now, influencer marketing had only ever targeted a fraction of influencers out there — macro influencers. Now we can serve micro- and mega-influencers and that’s a huge opportunity. What first inspired your interest in blockchain? Had you always envisioned blockchain technology being an integral part of your business? Our blockchain, and the tokenization of our system, was the brainchild of Shayan Zadeh, Mavatar’s executive chairman. He founded Zoosk and was one of the early adopters of blockchain technology. He saw how the micropayment issue was blocking adoption of our technology and suggested blockchain as a potential solution at one of our board meetings. It was one of the easiest decisions I’ve ever made. Can you tell us a bit more about your life before blockchain? How did you get into software development? My first project, Teksia, connected the financial resources and best practices in Silicon Valley with entrepreneurs around the world. It was a brilliant and formative experience for me as I built a very strong network of decision makers and technology influencers. Then we created Linkore, a management consulting company with three major focuses — executive search, investors, and customer relationship management. In essence, it was a concierge service for startups. We were helping them find the right connections, deals, and resources. I was involved in software UI/UX design at both companies. I ran them with my brother, a software and hardware engineer, and we couldn’t afford to buy much software so we decided to build our own. I come from a desktop publishing and design background, so my job was designing applications for our businesses; things like a résumé bank, event management systems, and networking software. Then, when I went to Stanford Graduate School of Business, I realized there was an opportunity to optimize the advertising industry. When I was a publisher, one question I could never answer was, “How can I calculate the ROI of an ad in our publication?” I thought it was time that technology answered this question because it’s a fair one. Everyone tracking advertising dollars to sales dollars needs a precise answer. What made you pursue a career in advertising? I’ve been living in the advertising world for almost my entire life. My parents were very entrepreneurial and forward-thinking and launched what I believe was the first advertising agency in Iran. They also worked as publishers and I followed in their footsteps. I started my own publications and this brought me into contact with advertisers. I also spent some time working as an advertiser myself. Working on both the buy and sell sides has made it easier for me to picture a win-win situation for everyone involved in the industry. How has advertising changed since your parents’ day? The sad truth is: not a lot. Most brands today are still pushing a “get it or regret it” type of push advertising in the hope that consumers will make a purchase decision faster. We have to ditch this paradigm and embrace pull advertising. This means attracting customers with content and empowering them to make smarter decisions at their own pace. 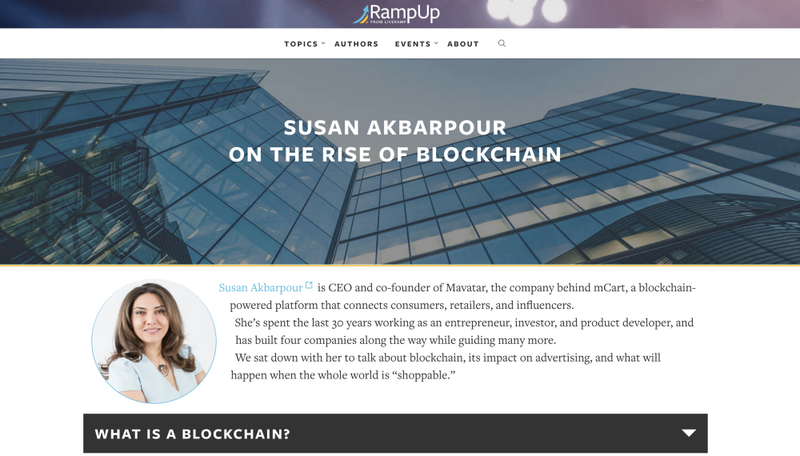 Susan speaks at RampUp Chicago ’18 on September 9th. Interested in knowing how to apply blockchain to your digital marketing strategy? Register for RampUp on the Road Chicago to hear Susan speak about this topic! Previous PostPrevious SEC reviewing BTC ETFs decision: could utility tokens be far behind? SEC reviewing BTC ETFs decision: could utility tokens be far behind?